Global Marine Propulsion Engine Market size was over USD 9 billion in 2015, and is anticipated to grow at 4.3% CAGR from 2016 to 2024. Use of renewable energy sources such as solar and wind energy to meet auxiliary power requirements will increase, thereby augmenting marine propulsion engine market growth. Increasing need for efficient as well as operationally dependable ships will lead to modernization of marine propulsion engine market over the forecast timeline. Rising emphasis on increasing diesel engine capacity to drive new generation tankers with large cargo holding capability will propel global marine propulsion engine market share. Rapid innovation in the marine propulsion engine market is forecast to result in powerful and energy efficient product development. Leading marine propulsion engine market players such as Wärtsilä and Rolls-Royce are continuously spending on R&D in order to innovate and enhance their product portfolio and increase ship power and capacity handling requirements. Growing shipping industry focus on developing electric motors to reduce fossil fuel consumption may help in increasing energy efficiency and eliminate environmental emissions. Depletion of conventional and shale gas reserves will increase LNG demand, especially as a marine fuel. LNG adoption requires availability of specialized insulated tanks and a safe area which drives demand for larger storage space. However, several alternative tank arrangements are adopted along with numerous system alternatives through which LNG can be utilized. Advent of nuclear propulsion systems act as a key interest for vessel designers as a small percentage of nuclear fuel is engaged in providing energy which is equivalent to a relatively high weight in coal or oil. It also proves to be beneficial for icebreakers while exploring frozen waterways in the Arctic. Increasing CO2, NOX, SOX, volatile organic compounds and particulate matter emissions could focus on non-conventional energy sources such as wind and solar energy. Wind & solar accounted for over 3.5% of the marine propulsion engines market share in 2015 and is estimated to grow at 5.9% CAGR from 2016 to 2024. Rising prominence of these systems as auxiliary power source owing to its environment friendly nature will drive the marine propulsion engine market demand over the forecast timeline. Gas turbines were valued at over USD 900 million in 2015, growth in the sector can be credited to high speed sprint operation mode offered by these turbines. Navy and military sector also offer massive growth prospects over the forecast timeframe. Solar and wind energy may gain prominence as auxiliary propulsion sources due to negligible environmental impact. However, incapability to suffice power requirements may negatively impact demand for marine propulsion engine market product. Introduction of fuel cells offer significant growth potential for ship impulsion, and may exhibit encouraging performances for low-power and auxiliary impulsion machinery. Asia Pacific accounted for 50% of the overall revenue in 2015, mainly due to high growth in Korea and China marine propulsion engine market size. 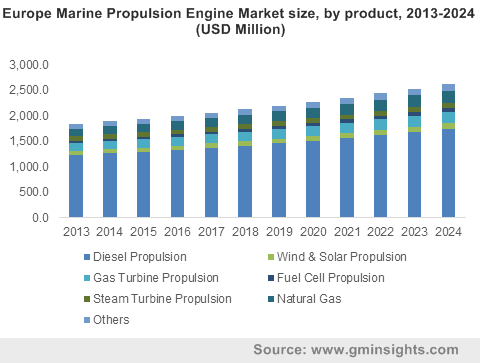 Rapid LNG adoption as a propulsion medium will drive U.S. marine propulsion engine market size in the coming years. Advancement in technology and increasing awareness pertaining to environment conservation has garnered vital importance in the marine propulsion engine market over the forecast timeline. Substantial CO2 emissions from conventional systems have led to the introduction of environmental regulations and carbon taxes to help mitigate climatic changes. Regulations by marine pollution convention (MARPOL) aids in preventing contamination by oil, sewage, chemical spills, and air pollution by engine exhaust gases thereby protecting the environment. Furthermore, non-adherence to government regulations may lead to severe national penalties. Key industry players contributing to marine propulsion engine market share include MAN Diesel & Turbo, Wärtsilä, Mitsubishi and Caterpillar. Continuously innovates in order to provide environmentally sustainable, flexible, economically sound, and efficient solutions are the main strategies adopted by these players. Other participants are Yamaha, Volvo Penta, Sinopec, Shell, Idemitsu, Hydrosta BV, Hydraulic Marine Systems, Exxon Mobil Corp, and Cummins. Components required for manufacturing vary as per the engine type. Typical components required for diesel engines include but are not limited to cylinder, cylinder head, crank case, crankshaft, piston, cam shaft, valves, and control panels. Gas turbines and steam turbines require components such as rotor, rotor blades, casing, bearings, valves, and electrical controls. Wind turbines require towers, blades, rotor, gear box, generators, and transformers. Manufacturers have dedicated professional sales staff having expertise in the company’s entire product lines for identifying specific and tailored solutions. After the point of sale, the respective company’s trained and certified technicians address various maintenance and repairing needs. Addiitonally, engine manufacturers have provide several in-shop and field service backed by factory support. Companies also have geographically dispersed spare parts distribution centers. End-users include small boats, recreational vessels, naval ships, merchant ships, LNG carriers, and coal carriers.